If you’re lucky and can turn on your car remotely one of the best winter driving tips is to preset your car to full blast defrost when you leave it for the night. Then in the morning a little before you are ready to leave your house click the remote start to warm up your engine and the interior of your car. 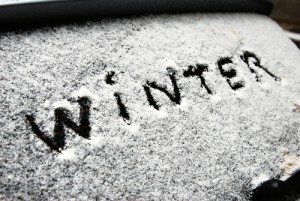 Doing that will also help make cleaning any snow and ice off your car an easier process. When it comes to clearing snow and ice off cars a lot of people like to skimp and clear just enough to see directly in front, but to be safe and not have any obstructed vision the windows need to be completely cleared. In addition to the windows, it’s good to clear off the roof of the car since that can slide down onto the windshield or back window and block your vision. It’s a common occurrence for piles of snow to slide down onto the windshield when a car stops at a red light or stop sign. Other items to clear off include the driver and passenger mirrors, any lights on the car and your license plate. Clearing off all those items does take a little time, but it will help keep you safe. As you are clearing the snow off your car take a look and make sure your path is clear to get out of where you are parked. Hitting the gas and hoping to make it over a snowbank or through fresh fallen snow is not a good idea and could lead to the car getting stuck or an accident. One huge winter driving tip is to keep your gas tank as full as possible. Not matter how safe of a driver you are there’s always a chance your car will break down or you’ll end up in a ditch and will need that fuel to keep the heater running while waiting for help. Keeping the tank full will also help in case you aren’t able to get to your gas tank if you are unlucky enough for it to freeze shut. When you are done driving each day it’s a good idea to lift your windshield wipers up off the windshield. Doing that helps to make the wiper blades last longer and it’ll be easier to scrap ice off of your windshield if you end up needing to. This entry was posted in Top Driver Blog and tagged Bad Driving Habits, Car Safety, Cars, Driving, Driving Practice, Road Safety, Safety Tips, Tips, Winter Driving.